From commercial flatware to commercial china, dining room supplies run the gamut from simple dinnerware to elegant tabletop finery. 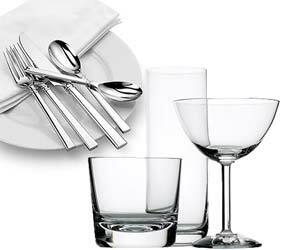 Select from myriad drinkware and dinnerware options, as well as flatware collections designed for function and style. When it comes to dining room supplies, the options are endless. Browse through our selection of restaurant flatware to find the perfect pattern and style for your establishment! Available from various high-quality brands, our sets of restaurant silverware will allow you to create the perfect tabletop presentation at your restaurant, café, or event. Our restaurant flatware is also available in a range of weights to suit your needs. There is no way to keep your customers happy without keeping an ample supply of glasses ready for use in your restaurant. Running out of glasses in a bar or restaurant has major consequences such as creating cranky customers that may not come back to your establishment, so having a variety of glassware glasses is essential regardless of the type of restaurant you have. The Serveware in this section comprises all that you will need for a successful service. Shop our selection of serving bowls, ramekins and more for serving entrees, and when it comes time for dessert be prepared with a set of dessert dishes or sherbert dishes. Steak houses know the importance of a high quality steak knife and we know the importance of giving our customers options that will set their dining service apart from the competition. We offer steak knives from the leading restaurant supply companies to help our customers get the exact look and feel that they are looking for in a steak knife. Steak knives are the best choice for cutting through roasts, ham, prime rib and of course steaks. This type of knife has a sharp, serrated edge that is able to slice through foods like red meat and pork much easier than a dinner knife can. If your establishment serves meat as an entrée, then a good set of steak knives is an absolute essential addition to your restaurant supplies.